In ?, the median annual gross earnings of full-time workers resident in the district are £?. The median across the Leeds City Region is £?, and the England median is £?. Split by gender, median earnings for full-time work for men are £?, and for females are £?. The earnings gap between Wakefield and England has narrowed slightly over the past few years for residents of Wakefield district. For jobs at workplaces in the district the gap with the Leeds City Region and England had been widening, as but then closed right up in 2018 (see graphs below). The Gross Disposable Household Income (GDHI) statistics provide a more complete picture of income, as these consider a broad range of income types (including benefits and pensions) and also account for taxes and other social contributions. There was some growth in incomes even through the economic downturn, but most of the income growth that occurred in the last ten years has not been as a high as growth across the UK as a whole. This income gap has widened as a consequence, as it has for the Leeds City Region (see graph below). Over the past decade, inflation (measured across the United Kingdom as a whole) has affected commodities and services to differing degrees. Clothing has actually fallen in price and the costs of recreation and culture have remained fairly static. The costs of transport and food rose markedly between 2006 and 2013, then remained fairly steady, but then increased again in 2017. The costs of education (mainly attributable to university tuition fees) have seen by far the largest increases and are continuing to climb. Within housing costs, inflation has been highest for electricity and gas. Council Tax inflation has been fairly low, held back since 2012 by a Government imposed 2% cap on annual increases. In the last couple of years, however, Council Tax bills have risen further to accommodate the adult social care precept. State pension incomes have been protected against price inflation since the 1970s, although the mechanism for this protection has changed at times. The problem in the last decade or so has been that annual increases in earnings from employment have not increased at the same pace as prices, so the value of those earnings has been diminished. The graph below shows the effect of inflation on full-time earnings of Wakefield District residents, and is very similar to the national trend. For those on median earnings, the value of their pay in real terms in 2017 is still less than it was in 2010, although the situation has improved in the last few years as wages have started to increase by greater amounts. The effect of inflation on people on lower earnings (lower quartile) has been less marked, and minimum wage and living wage policies have helped in this regard. Even so, while nominal earnings growth for lower earners was 44% between 2005 and 2017, the real increase in earnings, accounting for inflation, has only been 10% over this 12-year period. Estimates of average income for small areas are published every couple of years. The geographic scale of the small areas is the MSOA (Middle Layer Super Output Area). 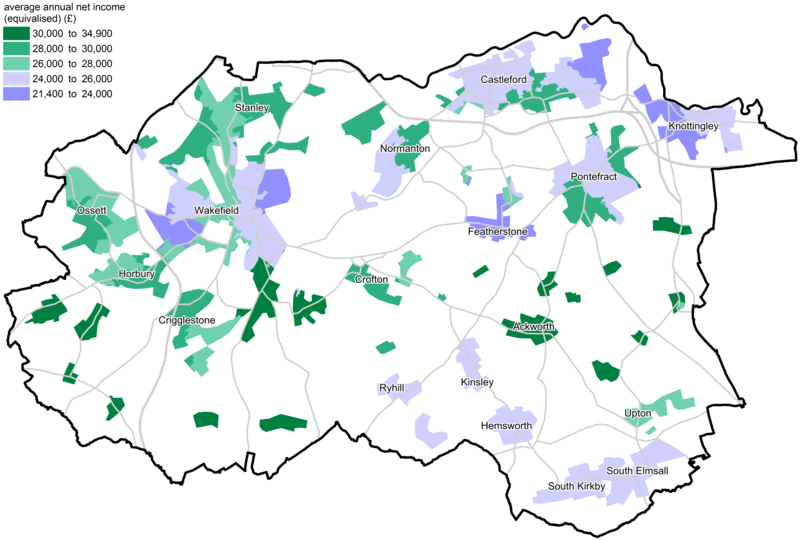 In Wakefield, each MSOA contains around 3,300 dwellings, or 7,400 people. Income includes gross earnings, self-employment, investments, pensions, benefits and tax credits. Net income is calculated as gross income minus the effects of income tax, NI, Council Tax, contributions to occupational pensions, child maintenance payments and parental contributions to students living away from home. Equivalisation adjusts the net income to account for household size, as a large income in a large household will not go as far as a comparable income in a single person household. All the income estimates are produced with confidence intervals, and these tend to be large. Statistically significant changes between consecutive data release periods tend to be rare as a result, and change over time comparisons are best made over longer time frames. Across the district, the average gross annual income in 2015/16 ranged from £29,300 in the Lupset area to £59,300 in Sandal. The gap is less marked when the effects of taxes, other outgoings and household size are accounted for, with the average equivalised net annual income in 2015/16 ranging from £21,400 in the Lupset area to £34,900 in Sandal. The highest average incomes are found in places such as Sandal, Walton, Notton and Woolley, and also in the east of the district around Darrington and Ackworth (see map below). Parts of Stanley and Horbury also have higher average incomes. The lowest average incomes are found in places such as Lupset, Eastmoor, Airedale and Ferry Fryston, Featherstone and parts of Knottingley. There are a wide range of average incomes in MSOAs across the region. Hull has the lowest income profile, and Harrogate has the highest (see boxplots below). Leeds, Sheffield and Bradford are all particularly diverse, with a wide range of incomes across their neighbourhoods. 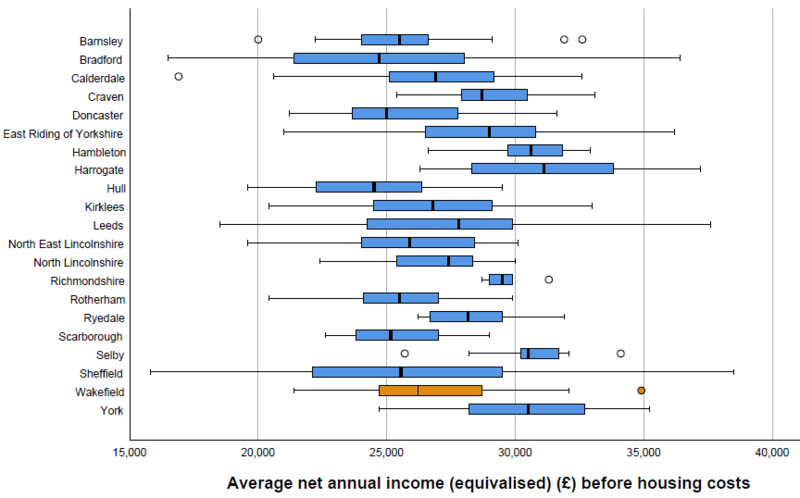 Boxplots of MSOA average net annual income (equivalised) across the region.